A black and white photograph of the water ski show at the Whitby Marina during Whitby Harbour Day. 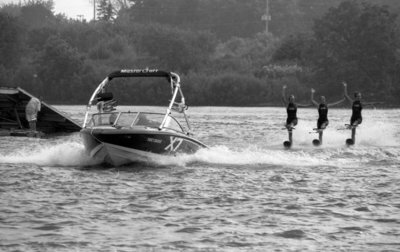 In this photograph three water skiers are performing stunts. Whitby Harbour Day is a summer celebration held at Whitby's historic harbour during the month July. Whitby Harbour Day, July 28th, 2007, Carl Ferencz. Whitby Archives A2013_035_002C.